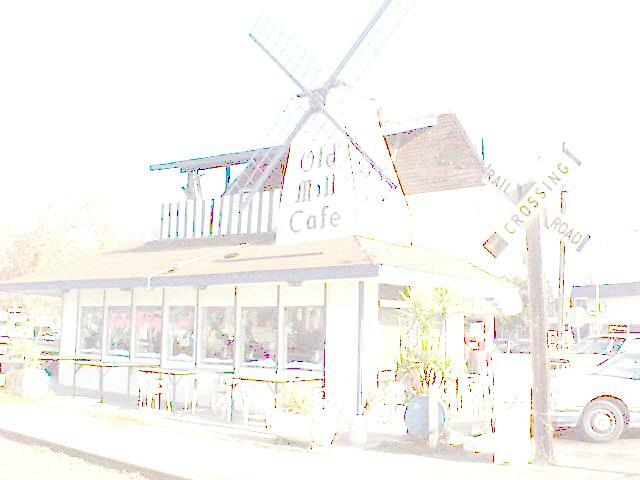 The Old Mill has been located at Needham and Ninth Street for decades and originally built in the 1800's and moved the this location as a railroad shop and later a restaurant. One of the oldest and most famous eateries in Modesto where all the old timers met to eat and rub elbows with the elite of the best in town. Now the regulars still meet at the new location and still are close enough to rub elbows and other things with the best in Modesto. The days are numbered as the city is going to tear it down soon, but Karin the owner; has moved to the new OLD MILL located on the old Smithy's site down the road at Ninth and F. One of her customers has put up the building for her and it is open from 5AM to 10PM every day.